On 6/4/15 I was presented with an 8yr, Warmblood, gelding competing as an Amateur 3'6 hunter. He had chronic foot soreness issues that, in my opinion, resulted in generalized neck, back and body soreness that affected his performance. The owners were frustrated and had used a number of diagnostics and treatment options to deal with the body soreness, but had not addressed the feet. Balance radiographs were taken and when compared to the original pre-purchase radiographs taken over a year previously, the horse had lost over ¾" of sole depth. The following radiographs were taken on 6/4/15 and again on 10/6/15. 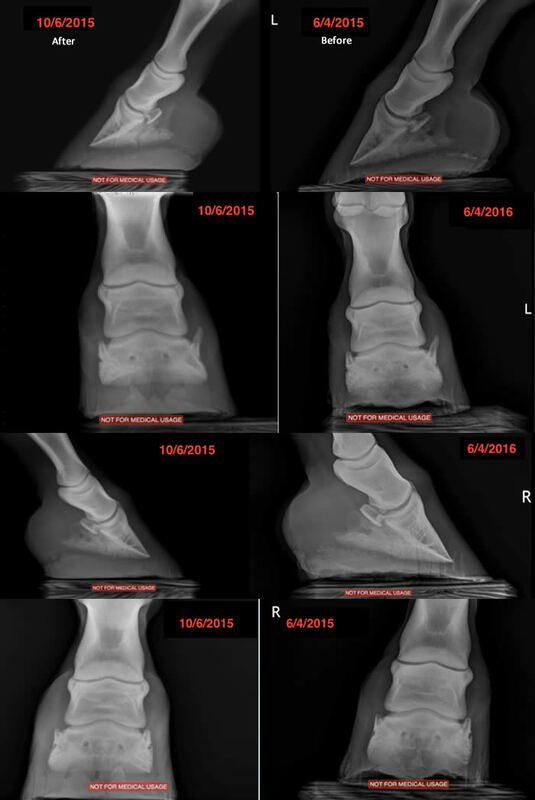 E3 Live for Horses was the only dietary change that resulted in an impressive increase in sole depth as shown in the radiographs below. I concluded that this product not only accelerated foot growth but improved hoof wall quality as well. Wayne: Yes, omg she is doing so much better not only is she walking again without pain so it appears but she is cantering up hill after her grain this product and her medical boot has worked a miracle. We were ready to put her down but no longer thank you for this amazing product. We are reordering with a bottle and a half left so we should have plenty till the new order gets here. Thank you so much for asking. Not many places out there that would ask let alone remember their customers that even sweetens the cake knowing you remember thank you. Best product ever for horses hooves. My 13 yo mare had an extremely bad case of thrush. 1 or 2 of her hooves was down to the corium. At her next farrier appt, her soles had doubled in thickness. A surface crack is finally disappearing too. The thrush was gone and hoof started to show improvement in 2 weeks. Of course, I had to soak her feet and give her care, but without the Perfect Horse product she would never have gotten so much better so quickly. I had complete faith in this product as my 17 yo mare has thin soles and the Perfect Horse helped thicken her soles so she stays comfortable now. This was proven by xrays. Thank you so much for an amazing product. My almost 20 year old Percheron/TB mare developed acute laminitis in August 2017. She could barely stand and I was desperate not to lose my beloved India. I thankfully came across the E3 product. After 5 months of 1.5 oz 2x/daily of the frozen product (applied topically to her supplements), she is back to enjoying life without the slightest sign of lameness. My farrier says her feet are great! I intend to keep her on a maintenance dose for the rest of her life as insurance! DEEPEST GRATITUDE for this wonderful product!! Really love the product. We’ve had great success with our two geriatric mares. Our farrier says our horses have great feet. Thanks! Dear Wayne....thank you again for devoting your life to helping animals who truly need a miracle. My boy, Dillan, and I are so blessed to have found you and E3Live. May I add, your website is the most detailed and informative I've seen on any horse supplement. After 9 days on E3Live (FOR HORSES), my horse is walking well. Before this, every step hurt him and the pain in his eyes was unmistakable. I haven't made any other changes to his diet other than adding 2 oz. of E3Live for Horses daily. Will keep you posted, but so far I've come to the conclusion your supplement is a "miracle in a bottle" for my gelding who has had chronic laminitis for 8 years. I just cannot say enough good things about the product I purchased!! In December of 2015, a vet told me that there was no hope for my horse and that I should probably start thinking of putting her down. Had a different vet come and look at my horse and decided that the bones in her hoofs had not turned and it was a possibility that we could save her. I did some research on the internet and found the product E3 live for horses. Decided to try this as I didn't really have anything to lose. The vet came to see how my horse was doing and could not believe how well she was doing!! He was totally in shock!! In six weeks she was up and moving around. Walking was not a problem for her. And yesterday she was actually running in the coral and kicking up her heels!! She still has to have her hoofs bandaged up for awhile, but what a difference this product had made!! I tell everyone but there are still some skeptics out there!! Anyways, I just had to tell you about this wonderful product!! =Really impressed this has given my 19 yr old horse a new lease on life. Has dramatically helped with inflammation. I take it my self and has worked well! My now 19 yr old Bashir Curly cross Dusty, suffered from severe heaves/COPD. The majority of my time with him was not riding but trying to find something to ease his breathing. Most days I could hear him wheezing before I saw him, especially, when on round bales. He was on prescription meds from the vet, and I had tried many herbal products, none of which ease his breathing issue. I should mention he is out 24/7 and I live in Ontario, Canada. Approximately 6 or 7 yrs ago, at a trade show, I came across E3Live for Horses. I was desperate at that point and had nothing to lose. I started Dusty on E3Live for Horses mid. March, within a month I took him off all prescription medication. In June when the vet came for their yearly visit, after examining 3 other horse and while examining Dusty she asked "Doesn’t one of these horses have heaves?” After less than 3 months the vet could not tell that Dusty was the horse with heaves. E3live for Horses has changed Dusty’s life. Dusty was gone from standing in the field struggling to breathe to running around the ½ mile track at his new barn. E3live for Horses has provided Dusty a quality of life. I highly recommend E3live for Horses! E3live for Horses has certainly been the answer to saving my horse (Toby). However, if I had just gone by the descriptions of the conditions this formula helps correct, I may have never tried it. Toby (A Morgan) has always had rock hard feet. I ride him in our mountains barefoot - often. Toby's coat has always been shiny and dappled. He has always been a beautiful horse. However, he is a crusty necked, easy keeper horse. To prevent founder, I have kept him off of grass entirely, no grain, grass hay only. (I have owned him from age 3 to now, age 14). In Dec 2013 Toby came up lame literally overnight. In all four feet. Painfully so. We thought founder. He was already on a mineral supplement from the vet for preventative measures for a couple of years actually. Over the next year and 5 months we tried everything the vets (2 + CSU Vet Teaching consultations) said to do. They admitted they were grasping at straws. His tests showed no to all the diseases you would suspect and insulin was in the normal range, but not fluctuating as it should. He has never been given a definitive diagnosis. I also tried everything the equine herbalist threw at us. Toby was up and down but never really better. He moved like a person with MS. It was like his brain could not communicate with his feet. He hurt all the time. He was laying down so much he had sores. This is the "readers' digest" version so I don't go on all day. We made the decision to end his suffering end of March 2015. I read an article about your product and felt compelled to try this one last thing. He was showing signs of improving after a month. He was 90% sound after 3 months. I started riding him again at 4 months. We kept him at a dosage of 6 scoops in the am and 6 scoops in the pm for that time. I am slowing decreasing him and now he is at 3 in the am and 4 in the pm and will remain there through Dec. This horse had a hard time with cracking hooves and keeping shoes on! This stuff is amazing i was having such a hard time with cracking and keeping shoes on my paint. I tried all kinds of hoof supplements and some would help but wouldn't work like I was needing. Till my farrier told me about this stuff. "I could not be more happy with this product I refer it to anyone that I talk to that has hoof problems." Horse with shelly, cracked feet. 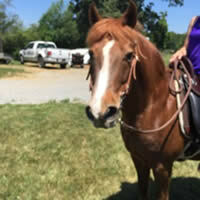 "My horse came home after 6 months in a different barn, with shelly & cracked feet. Gave him just a little bit, not even the recommended feeding and his feet are completely different, no shelly feet. They are amazing; I am a true advocate now! Heather (my shoer) talks about E3AFA FOR HORSES all the time." "My horse and donkey's feet are noticeably improved after 6 weeks on E3Live FOR HORSES so I am sold on your products and telling everyone about them! " I have been using E3AFA for myself and E3Live FOR HORSES for my horse, Reggie, since May 2011 and have been thrilled with the results for both of us. Reggie was prone to horrible allergies/hives, especially every August for the past several years. August 2011 –No Hives! His farrier believes his hooves are in the best shape this year as well. "I've been much more active, adding tennis to my activities. I've lost 20 lbs." For myself, I feel I’ve been on a more even keel, even with lots of stress going on in my life. I've been much more active, adding tennis to my activities. I’ve lost 20 lbs. since May without doing any drastic dieting. I've had one sniffle, which did not turn into anything further. I stopped taking daily allergy medications since starting this supplement. I used to wake up with eyes I could barely open. Not anymore. No Hives! His farrier believes his hooves are in the best shape this year as well. "I highly recommend these supplements (horse and human) for one and all." My Donkey Did Not Get Laminitis! "I started using E3 AFA FOR HORSES initially for my donkey who would always get winter laminitis; we feed it to the rest of the herd. Though we are just coming out of winter, she did not get it (laminitis) this winter and I am Really happy about it!" "I AM REALLY HAPPY ABOUT IT!" FYI: I started using this with my horse, Haiku, in October '12 because of his hooves. He is barefoot in the pasture and he wears sport boots whenever he is not on soft footing. I routinely treated him for thrush, but had little success. E3Live was recommended to help with good hoof growth. Because I had already tried several products, I was doubtful that this would be any different. "It has been three months now and I am thrilled with the health of Haiku's hooves." I use a Rider's Rasp once/week to maintain the "Mustang Roll" between my farrier's trims. His hooves are thrush-free and they are now hard. Another benefit is his beautiful coat. I do keep him in water-proof blankets, which helps, but he has a new sheen that is beautiful! I put him on a loading dosage of 2 Tbs/day for a month and then just 3/4 Tbs since then. Also, I suggest you mist the flakes with a bit of water because they do tend to blow around. "I love this stuff! Give it a try. Nothing to lose with their 100% guarantee"
Ok I have to be honest. I have turned my horse out so I haven't been feeding your product to him through the winter but I will start soon. I do have to tell you that I have used it on my rottie who is now 11 yrs old and she is like a puppy again. she used to be stiff all the time and limp around everywhere. she would lay around all day and now you can't keep her inside! She runs all over the farm like she used to when she was a pup. I think its even like happy medicine because she is a different dog. I will let you know how my gelding is doing after about six weeks to see if it helps him as well! Thanks for checking back with me that's truly impressive! "11 yrs old and she is like a puppy again"
When I discovered E3 Live™FOR HORSES in March of 2012, it changed my horse's life as well as my own. My horses mean everything to me and when they are suffering, I am suffering too. Mariah is a 1400lb., 16.3 hand Percheron Thoroughbred. She has had multiple hoof problems since I have owned her. She has suffered with brittle, shelly, cracking, thin hooves. Add white line disease and rotation of her coffin bone to the problems. I had tried so many supplements and topical applications trying to help her, but nothing worked. She could not keep shoes on and each time the farrier came, I honestly believe that he said a prayer that he would find some sort of hoof to nail to. I kept searching for something that would help Mariah and then I read about E3 Live™FOR HORSES. I first put Mariah on the frozen E3 Live™FOR HORSES. In about 6 weeks her hooves were better. After several months, I switched to the E3AFA™FOR HORSES and you should see her incredible hooves today. I am so impressed with E3 Live™FOR HORSES that I have all my horses on the product, from my 18.2 hand Hanoverian to my miniature horse. "My horses mean everything to me and when they are suffering, I am suffering too"
We have a 17 yr. old perlino quarter horse that has always had feet issues.Naturally we have tried various supplements as he is an excellent pick-up and rope horse, very athletic and brave. We would always have to do his resets at least a week before a rodeo to give him time to get comfortable, often with bute for a few days. I read about E3 live FOR HORSES last March, 2012 while we were on holiday in Alabama, and started your product then. By the summer of that year we were seeing a difference in his comfort level. After 6 months his hoof condition was improving, not as shelly, walls were stronger and the nails were staying in longer. By Nov. of 2012 Dually was able to go from a 0 shoe to a 1. How great for him! We finished the rodeo season in Ontario, Canada with his feet still strong and no wait period after resets. "He will stay on your product for sure. We are happy to be able to get it from you in the US and when we are home in Canada." ~Written Jan. 2013. Thanks again, Donna. Reuben Miller is a Farrier with a long-standing reputation as a laminitis specialist. 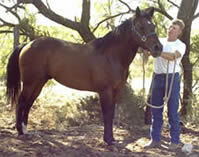 "A horse I had been shoeing had suffered white line disease in the front feet. You could insert a #5 nail in the separation and run it completely around the hoof from heel to heel. After shoeing with pads the horse was still tender footed and the hoof wall left very little place to hold nails. As well the horse had no heel to speak of, a problem which had been ongoing for at least a year. After six weeks of two tablespoons twice each day of live E3 LIVE™FOR HORSES, the feet completely changed, the laminae reattached, no more breaking away and the horse developed a good strong heel. The change was very noticeable from the appearance of the outside hoof wall. There was no more hollow sound from within because it had filled with good clear hoof material." "I have never, in twenty-five years of treating lameness, seen abscesses clear up so quickly. Some of the things I have seen in such a short time, I wouldn't have believed if someone just tried to tell me. I have not seen anything that good." Ryan Gingerich talks about why he has chosen to endorse this amazing product that has helped hundreds of horse owners with some of the worst hoof conditions imaginable including shelly feet, laminitis, and white line disease. Together with Wayne Blevins, Owner of E3Live™ For Horses, they discuss the great success they have had on both personal and professional levels with this one of a kind, naturally occurring, blue green algae (Aphanizomenon flos-aquae) from Klamath Lake in Oregon. After having my mare Prissy for 24 years of her 27 year life I am the one who knows her better than anyone. When she began to get sore feet I thought I was in for trouble. She foundered on me once and I was hoping that founder/laminitis was not the case this time. My Farrier came for his regularly scheduled trimming and we began to see she was developing seedy toe. I searched the internet high and low for a miracle cure when I came across an article praising your product. I checked out your web site E3 Live™FOR HORSES. After seeing the guarantee, I figured what have I got to loose. I ordered your product one week before my Farrier's trim schedule, and started Prissy on the E3 Live™FOR HORSES the day she was trimmed. I started slow with a ounce twice a day, gradually working her up to 1 and 1/2 ounces twice a day. It has been six weeks and five 16 ounce bottles to the day, my Farrier came today and said I don't know what your doing but keep doing it, this mares foot has grown 100% more between trimmings and it looks a lot healthier too. Thank you Wayne E3 Live™FOR HORSES has given Prissy new life in her feet and her personality seems to be a lot brighter too. I am looking forward to the rest of her life and keeping her on E3 Live™FOR HORSES however long it may be. Keith Seeley (her specialist Farrier in founder treatment) recommended I supplement Nikki’s diet with E3 Live™For Horses. It was no more expensive than any other national brand supplements, and all else had failed so I decided to give it a try. Nikki has had many setbacks along his journey and I was beginning to think he would never manage to grow sole and hoof, and that he would not recover. The E3 Live™For Horses has proven to be an outstanding product. I feel as if I am watching new sole grow before my eyes. The improvement in his feet is amazing. Keith came to Florida again in May and gave Nikki a really good trim on May 21st. Kelly Hall (an accomplished trimmer and a good friend) has continued to help me keep up with the trim and keep Nikki's feet in balance. I don't know what I would have done without Kelly over the last year. Although the E3 Live™For Horses is doing a great job promoting sole growth, the trim was essential to accommodate the changes in Nikki's feet. It is the combination of correct trimming and the E3 Live™For Horses that has produced such great results. I was initially giving Nikki 1.5 oz. of the E3 Live™For Horses, twice a day. I had to cut that down to 1 oz. twice a day because he was actually growing sole too quickly. In addition to the progress in his feet, the E3 Live™For Horses seems to be helping to heal some bad bed sores he developed last summer when he was laying down all the time due to abscessing. Nikki has had a couple of abscesses since I started him on the E3 Live™For Horses, but they have been small abscesses and very fast to resolve - this is also attributed to the E3 Live™For Horses. Nikki's progress has been miraculous since he was started on the E3 Live™For Horses. It is only a matter of time now before the soles close up and he will (finally) have real feet again. What day that will be! Reuben Miller is a Farrier with a long-standing reputation as a laminitis specialist. This is his experience with E3 LIVE™FOR HORSES.... "I have never, in twenty-five years of treating lameness, seen abscesses clear up so quickly. Some of the things I have seen in such a short time, I wouldn't have believed if someone just tried to tell me. I have not seen anything that good. Herb Stone (aka Stoney Meadows) 7 times Seniors World Champion, 12 National Championships, and Gail Rich, (aka Miss Wylie P. Fox), 3 times Senior Women's World Champion, 5 National Championships, both compete in Cowboy Mounted Shooting. This high speed event requires athletic and mental excellence of horse and rider. They have also trained four other World Champion horses and competitors, as well as many other local and national champions. Stoney and Miss Wylie use and recommend E3 AFA™FOR HORSES to eliminate fungus pockets for strong healthy hooves and believe it improves their horses' athletic ability and mental attitude to compete at World Championship levels. 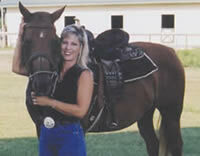 Jennifer Mikkola is a trainer in Placerville, California. She is well known in the area for taking on (rescuing) harness horses from Cal Expo and re-establishing them in the local area as trail or cart horses. 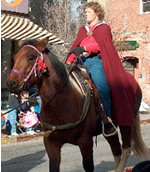 She is a regular on the yearly wagon train from Nevada to Placerville every June, and many of her rehabilitated Standardbreds are participants. The first thing Jennifer does with a new horse from the track is feed the E3 AFA™FOR HORSES daily. 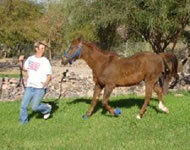 Whether to rehabilitate hooves or just help the horse focus on its new training, it gets results. 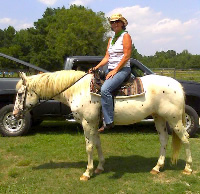 Jennifer has used E3 AFA™FOR HORSES, on over thirty horses over the last six years with the same great results. The Kaleas Family of Camino, California acquired (rescued) Rabbit, a Standardbred horse from the Cal expo racetrack. Jennifer Mikkola, E3 LIVE™ FOR HORSES distributor, rehabilitated and retrained Rabbit with the help of a daily diet of E3 AFA™FOR HORSES. Both Rabbit and their pony, Brandy, have been eating E3 AFA™FOR HORSES for over a year. They are both healthy, happy and part of the Kaleas Family. After his Belgian draft horse suffered extreme hoof damage from fungus and overall poor material, Scott Rawles started Apollo on a tablespoon a day of E3 AFA™FOR HORSES, in September of 2003. The Farrier protected the hoof with wide web shoes and acrylic filler because much of the hoof wall had been destroyed. In November 2003, new shoes were applied without filler needed due to tissue regeneration in the damaged areas. By January 2004, the horse had grown beautiful new hooves and the Farrier was able to pull shoes and trim hooves with confidence that the horse would do well barefoot. Scott remarked, "The hoof is white as marshmallow and the knife glides easily through it." Their second horse, Breezy, started on E3 AFA™FOR HORSES at the same time, and she developed a shine to her coat and a noticeably healthy appearance. Scott eats four capsules of E3n AFA™ (human product) daily and says he has increased energy and stamina. 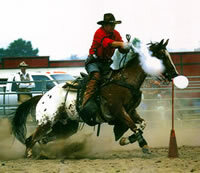 Roy Evans is the instructor and owner of Midwest Horseshoeing School. Roy is a distributor of E3 LIVE™FOR HORSES and has been conducting case studies of his own. Both he, and graduates from his school, have seen the positive effects. This is a picture of Roy when he was teaching Wayne Blevins to shoe some 30 years ago. "Horses eating E3 LIVE™FOR HORSES, in my clientele, do not develop fungal problems. For those that had fungus, it went away in 6 weeks to 3 months." Ernie & Talitha Frye of Ballinger Texas has been using E3 LIVE™FOR HORSES for their horses and their clients since October 2003. Ernie is a 1996 graduate of Texas State Horseshoeing School and received his Journeyman 1 Certification from Brotherhood of Working Farriers Association (BWFA) in Georgia in 8/03 where he is continuing his education. 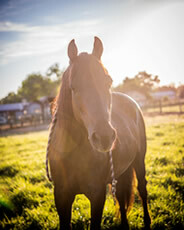 Besides being a Journeyman 1 Certified Horseshoer, Ernie trains colts and cowboys too. Talitha is a Mom who not only home-schools her children but is the Secretary and Business Manager for their horseshoeing and training business. The BWFA is where Ernie saw the difference E3 LIVE™FOR HORSES and E3 AFA™FOR HORSES can make for a horse and started telling his own clients who had problem feet about it. Their clients are happier with their horses, Ernie & Talitha are happy too as E3 LIVE™FOR HORSES and E3 AFA™FOR HORSES is helping the Frye's business and the hoof problems go away. John Coates had been using E3 AFA™FOR HORSES to combat reoccurring founder in two of his ponies. After seeing the ponies return to their inflamed and foundered state several times when he had discounted the E3 AFA™FOR HORSES, he decided the a steady diet was the best thing to keep the ponies happy and healthy. Yvette Youngblood of Clyo GA reports that her beautiful brood mare 18 yr old Amy had foundered and rotated in one hoof, her soles looked shriveled up, with weak hooves that cracked easily and couldn't keep shoes on. E3 AFA™FOR HORSES was suggested and Yvette decided to give it a try. Amy's feet always looked flat, even after shoes were put on, but her Farrier, Kenneth, couldn't believe his eyes after just 6 weeks of E3 AFA™FOR HORSES. There was a new clearness in the sole, her feet look great, and she’s up off her heels with has better angles. Yvette just couldn't be happier that her sweet Amy is doing so well. "After a year of using E3 AFA™FOR HORSES it's literally amazing, and I’m considering breeding her again." Yvette takes two E3 AFA™ (human product) capsules a day herself for the added energy and the difference in her hair, which has grown twice as fast and is stronger (even her hairdresser asked what she had changed ). 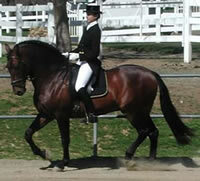 Gavilan IV is an Imported bay Stallion, bred by Pedro Maza, approved by the Cria Caballar in Spain. "We believe that feeding E3 AFA™FOR HORSES gives us the basic nutritional requirements that our horses need for the strenuous demands of a breeding schedule and show ring. Since we put two of our stallions on a regular diet of E3 AFA™FOR HORSES, they have shown a distinct change in hoof quality, as well as quieter dispositions. Jackie and David Schuesting of Camass Andaluz, Placerville, California. Angel Usategui, World Champion Paso Fino Owner/Breeder says "I have never seen anything like this. I can't tell you the difference the E3 AFA™FOR HORSES has made in the weaning colts and in the mothers. I had a case of laminitis in one horse, it is gone and the hooves are better than they ever were before. Also, I feed E3 AFA™FOR HORSES, to my top Champion Fox Terriers. The 2 1/2 week old pups are so far advanced, I am amazed. I took them to my veterinarian and he said he has never seen anything like this either. I am feeding the E3 AFA™FOR HORSES to all of my animals. It has made a big difference." What Captain Stephen B. Sloane, USN, Ret. Professor of Political Science, Owner of Rancho Luna Azul, and Therapeutic Riding School for Mentally Handicapped says about E3 LIVE™FOR HORSES: "Coat shines, eyes are bright, main and tail grows more profusely and hooves are strong and solid." Ray and Linda Tygenhoff have been feeding their four horses E3 AFA™FOR HORSES, for several years now, and are working hard to spread the word to many other horse owners. Bob Cairns feeds his horse, Caesar, E3 AFA™FOR HORSES, because he can see the difference. Caesar has a lustrous coat and strong hooves that go most of the year barefoot. Jaqcui Jenkins lives in Jackson, California with her mule Max, and Quarter horse Isabeau, who both enjoy better health and hooves, since starting on E3 AFA™FOR HORSES in the spring of 2002. Jacqui says "Hey Wayne, just went to the website and it is so beautiful. I was taken by surprise when I saw the picture of my 'children' Isabeau and Max the Mule. The brief statement kind of covered what I have been telling you since 2000, but it didn't say nearly enough. Even though my animals are not expensive show horses, I still have taken a misguided pride in the fact that I paid dearly for supplements for their health benefits. When you and I first met, my mare's feet were a mess. Her walls were thin and there was a large separation. It was a challenge to keep shoes on her. A Shoer in Nevada had taken the heels down to the nub on the mule, compounding an existing rear ankle problem. You suggested E3 AFA™FOR HORSES and I responded. Better yet, the animals responded. It has taken some time, but you now have some of the best horse feet in this county to work on. "When I mentioned earlier about being misguided, I was referring to the fact that even though I was spending roughly $150 a month on supplements, by switching to the right one I finally have solved a multitude of issues. One bottle (50 grams) lasts the animals 6 plus weeks. I get a new bottle (50 grams) every 6 weeks when you come to shoe, making it the least expensive, longest lasting supplement I have ever used. I have not had an emergency vet call in 4 years. A horse is only as sound as its feet. 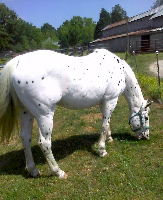 The mare is 15 and the mule will be 21 in August of 2003. They are in perfect health and their feet are in perfect condition. Thank you again for introducing us to E3 AFA™FOR HORSES. It has made all the difference." My horse, Colonel, no longer favors his right shoulder and has NO sign of laminitis (the reason I started him on this product). He came in as a rescue from USERL (United States Equine Rescue League) triangle region and soon after I adopted him, we dealt w/white line disease and then laminitis (again 2 of the most effective results from use of E3 Live™FOR HORSES). I'm so pleased and have told so many people about the product (of course, I have been dealing with skeptics). "I have been using E3AFA™ caps for myself and E3Live™FOR HORSES for my horse, Reggie, since May 2011 and have been thrilled with the results for both of us. Reggie was prone to horrible allergies/hives, especially every August for the past several years. August 2011 – No Hives! His farrier believes his hooves are in the best shape this year as well. For myself, I feel I've been on a more even keel, even with lots of stress going on in my life. I've been much more active, adding tennis to my activities. I've lost 20 lbs. since May without doing any drastic dieting. I've had one sniffle, which did not turn into anything further. I stopped taking daily allergy medications since starting this supplement. I used to wake up with eyes I could barely open. Not anymore. I highly recommend these supplements (horse and human) for one and all. I am about to purchase some for my sister."